Home » Products » Fly Control Products » Fly Control For Horses » What Are Fly Predators? Fly Predators are nature’s own enemy of all common manure and rotting organic matter breeding pest flies, including the common House Fly, Biting Stable Fly, Horn Fly, and lesser House Fly. In the natural environment Fly Predators® serve as a major check of pest fly populations by destroying the next generation of flies in their immature pupa (cocoon) stage. Fly Predators are tiny, completely biteless and stingless, and never become a pest themselves. Because of their small size and the fact they live their entire life cycle on or near manure (where the pest fly pupa are typically found), Fly Predators go virtually unnoticed. 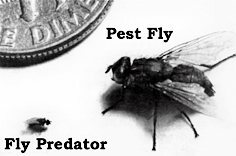 The current mixture of species marketed under the trade name Fly Predators include: Muscidifurax raptorellus, Spalangia cameroni or Spalangia endius and Muscidifurax zaraptor, and at times insignificant quantities of other fly parasitoid species. These species have been proven effective by both scientific tests and from decades of actual usage. Fly Predators® is the brand name Spalding Labs owns and trademarked for our combination of fly parasites. Others offer different brand fly bugs but they’re not Fly Predators. The species are different and the difference in performance can be huge! One competitor’s product is 90% Nasonia vitripennis, a species which is notably lacking in scientific support for effectiveness with large animals. Eight published evaluations reported that Nasonia was ineffective. The only positive evaluation we could find was for chickens. By comparison, the Genera of our species have 43 positive published scientific evaluations for fly control with all kinds of animals, large and small. Plus, we guarantee live delivery of the quantity ordered, and typically, the total season cost is lower due to needing fewer shipments of Fly Predators for many locations. Don’t settle for anything less than real Fly Predators. The other huge difference between Spalding and any other fly company is the comprehensive information we provide on all aspects of fly control. From our knowledgeable phone reps, publications, our videos, and our web site there is no better source to become fly savvy which leads to fly free. Mackinac Island is an example of how important good information is. They had been using a different competitor’s fly bugs with poor success due to inadequate and incorrect guidance from that vendor. The vendor was even selling the island House Fly traps when the big problem was Stable Flies. After switching to Spalding, Mackinac’s fly problem is history. Spalding Labs has been helping horse owners successfully manage their pest fly populations since 1976. Our genuine Fly Predators® brand is carefully formulated from a unique blend of bugs to control the most varieties of pest flies commonly found on America’s horse farms. Fly Predators can be the answer to the success of your fly control plan too. You don’t have to just take our word for it either, read a few of these real verified reviews from some past customers to see why Spalding Fly Predators are the right choice.